...and what does he care?! damn! I just hate it when he'd pick on some points not knowing his own weaknesses and other damned businesses. I'm good and I don't pick on anybody's business and I mind my OWN! Sorry guys this blog seems to be for my rants here and there. It's just that I am even freer here than any other place. I just hate people who act like a perfect guy not knowing his own faults and mishaps in life. Why not look at himself at the mirror before saying anything right? Who disagrees? Urgh! Angry face. Doesn't Know How to Eat Properly? As the days are fleeting these days my excitement also heightens with the idea of coming back and work in Doha. There is nothing so comforting just thinking of staying with the people I consider as my second family in the Middle East. They are the same people who treat me like I am one of their family even if they don't know me so well for we only meet just a few months ago. I hope this second leg of my two-year-contract would be the greatest working experience abroad for me. All I can say is, 'Get it on!'. Smiles. Perhaphs, this awesome picture would give you a glimpse of how my place looks like there in ME. 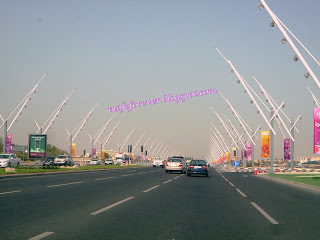 :) I took this picture when I was on the way to Aspire city with my second family before I came home for a short vacay in my precious hometown. I don't know how to express my joy of seeing one of my close friends back in university when I saw her in one of the big malls around town two days ago. I can see no changes in her except that she's got a one year old baby now for she already got married two years ago. We just enjoyed ourselves shopping and shop hopping for almost three hours of being together. Exchanging laughters and jokes reminiscing our uni days in USC main cracked me up while choosing some clothes at Celine's. I hope we can have another getaway before I go back in two weeks time in the dear land of camels. Grins. It just made me realize how time flies and how much I missed her. I hope to really find my niche here when I come back home next year. Promise, I won't go back there in ME and definitely this is my last year there. Sighs. What a Great Day! Wooohooo! It's been days now with my colds; still, I'm not getting any better. Sighs. I've been doing some researches here on how to alleviate this malady since it's hindering me from my daily tasks. Anyway, I've found some cool and informative sites highly recommended by my friends. I visited them and I discovered that only a complete rest, relaxation, and drinking plenty of liquids can make me even feel better. Well, I didn't go out today as planned because my body is aching though my mind says that you'd be better hang out and go somewhere with friends to make the most out of my two-months-vacay. I hope I'd feel better tomorrow and hopefully meet my high school buddies to plan for our most-awaited reunion. I just hope...smiles. Being Super Busy is Good! I just transferred to my new flat this afternoon and it was so great to really be with a complete family. Oh how I miss to be just feeling at home. This place is just another comfortable niche I’ve finally found here in Doha. Smiles. After all, I’m looking forward to travel back home again this time from the Middle East of the globe, grins. Well, traveling isn’t new to me and as I’m constantly being away from home, I can say that there no place like it. I hope my flight would be great and hassle free. I know I can’t bring a lot of stuffs unlike in China this time for I’ve got a lot more responsibilities lining up but what matters most is that I can have my break from the stresses I’ve been having here. A lot of my friends said that I’m far way better off in China. Incredibly I know it’s true but I’ve got my word on this and since I’ve started this, I’ve got to endure everything until the last day of my contract which is hopefully on June 2011. All hopes are what I’m holding on together with my loved ones’ prayers and my loving boyfriend’s faith in me. These make me even driven to achieve every goal and surpass each challenge that comes my way any time and everywhere. Smiles. After all, I’ve found my second family here in the ME when I’m gonna be back next school year so as far as I can see it’s gonna be another great and happy year for me hopefully almost like the one I had in China. Grins. Nostalgic face. Urgh! I’ve just halfway finished my grade computation, sighs. Oh well, I’ve got to doze off for now since I’ve got to go to school early as much as I can for we have to finish our play decorations and we’ve got to do the dress rehearsal too for our invitations to be finalized. We are going to email it ASAP to the parents probably this Sunday. We're just holding on to our hopefully much awaited success of our play next week. Thanks Ms. S. for your undying support on me all through out most especially on this play production project. Grins. Good night y’all guys. Smiles. This morning I woke up a bit late as usual. As I opened my door I saw my housemate’s lovely face and she greeted me a sweet good morning. I smiled too and that somehow eased the tensions I’m feeling after a weird dream. I didn’t know that she’s abhors cockroaches when suddenly she jumped up and down and ran to her room immediately after seeing a tiny cockroach on the floor. I laughed out so loud I almost hurt ran out of breath. J Then she came inside my room and invited me for a coffee. While sipping the sweet aroma of my favorite morning drink, she had a great idea of cooking the veggies in the fridge for brunch. I volunteered to cook it for I felt like cooking and we listened to the great oldies which bring a lot more memories from the past. After cooking, we heated our rice and prepared for brunch. Meanwhile, I prepared my all time favorite cartoon – Family Guy. We watched it while having a sumptuous meal. Smiles. We chatted and had so much fun this morning, indeed.